President Brand Street has been declared a national conservation area, and is home to a number of monuments and buildings of historical value. Nobody visiting Bloemfontein should pass up the opportunity to stroll down one of the city's most stately and historically important streets, encountering striking examples of 19th and 20th-century buildings along the way. This street is the address of the South African Court of Appeal, Fourth Raadsaal, City Hall, and the Supreme Court of South Africa. See the original transcript of Die Stem, part of which is still included in the South African national anthem, at the National Afrikaans Literature Museum, or visit the equally interesting National Music Museum. Bloemfontein's City Hall was completed in 1936, its cornerstone laid by Prince George, the Duke of Kent. 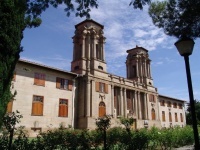 While the government building complex was completed in 1877, alterations and improvements were made over the years by the architecture firm of renowned architect Sir Herbert Baker. The Old Presidency was built in 1861, on the spot that was once the British Major Henry Warden's farmhouse. The sandstone buildings give the area a distinct character and aesthetic, worthy of some great photographic opportunities.